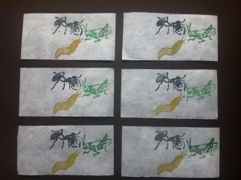 I have been printing a bit! Here’s an image of the block after I’ve done much of the carving. 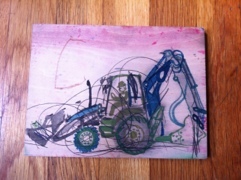 I carved some of my son’s drawing but not all of it. 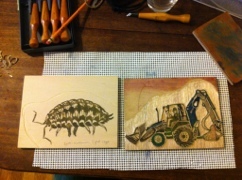 Next to it is a block with a drawing of a sow bug (or wood louse or whatever you like to call it) that I drew from life directly on the block from a live model scurrying around in a jar. I have just barely started carving this one. 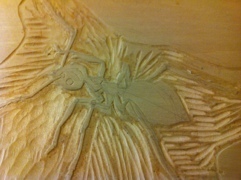 And here is an ant I’m about halfway done carving. 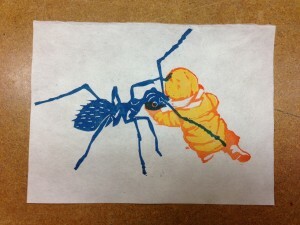 I drew this in pencil on the block from a macro photo of an ant that my dad took. Stay tuned to see if I can put this all together into a finished print before I leave to teach my class at Peninsula School of Art next week!